The start of the race and Andrea Iannone survived the scrutiny over a possible jump start. 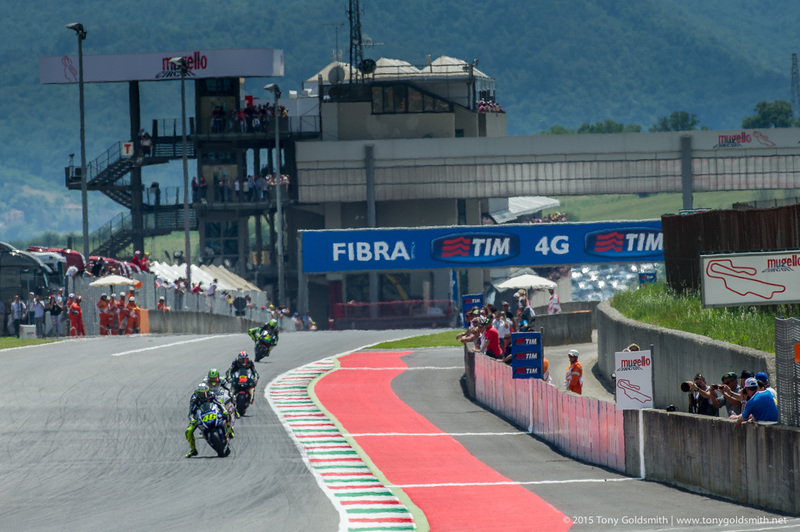 The Tuscan hills provides a stunning backdrop to the Mugello circuit. Valentino Rossi saves a big moment in Turn 1. 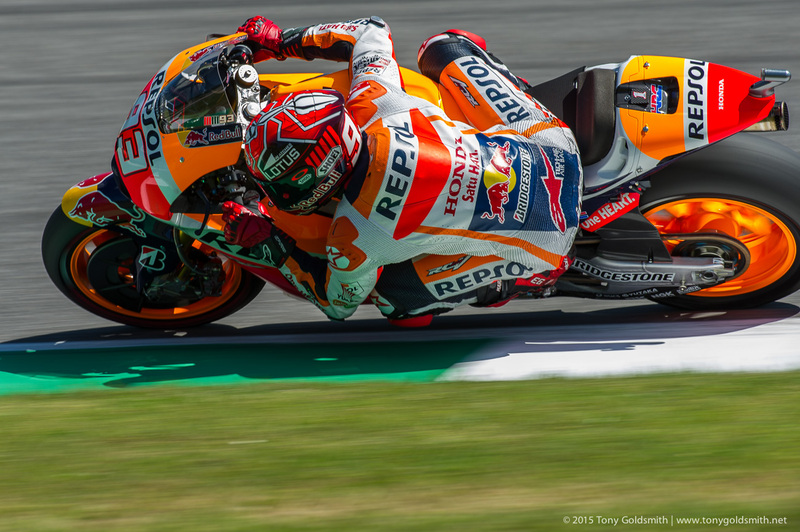 Over the past two years, Marc Márquez and his team have proven to be a master of strategy. They have found a number of innovations, most notably the two-stop, three-run strategy during qualifying, and the bunny-hop bike swap during flag-to-flag races. Santi Hernandez has earned his reputation as a brilliant crew chief, and as a strategist capable of finding advantages in places where other teams simply haven’t thought of looking. So for Márquez to first miss out on going straight to Q2, and then make a fatal error again in Q1 leaving him in thirteenth is frankly shocking. Jorge Lorenzo looks a strong bet to continue his recent winning run. 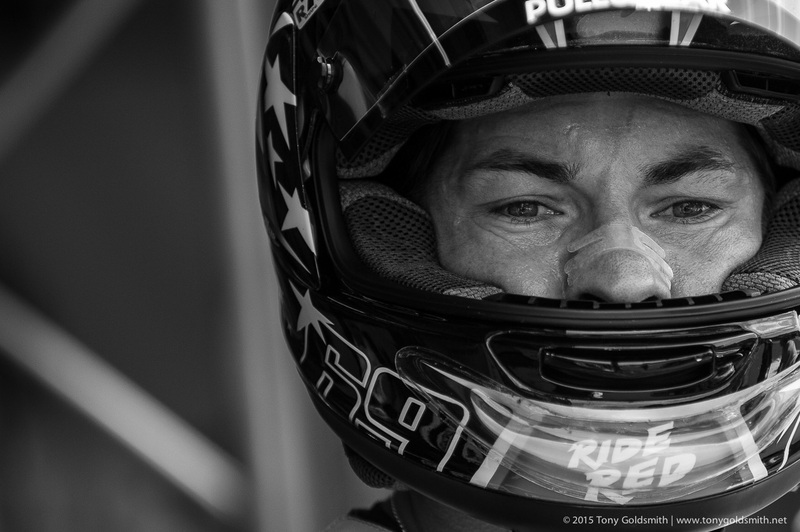 19th on the grid for tomorrow’s race for Nicky Hayden. 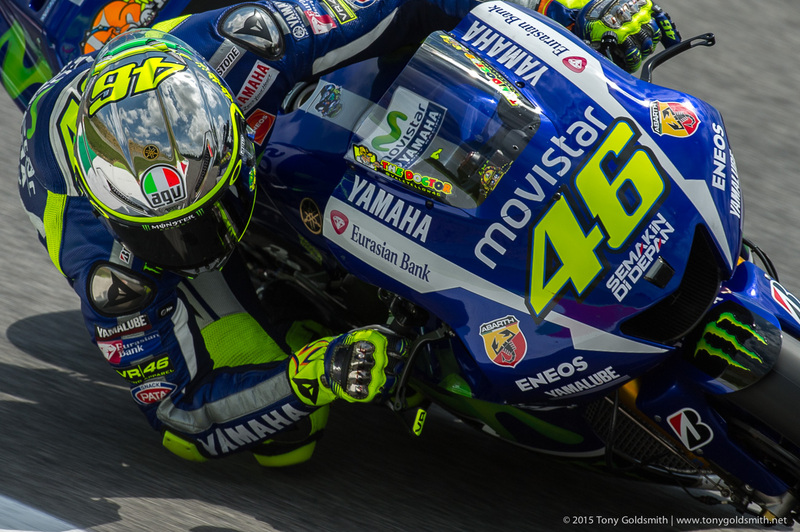 Valentino Rossi’s 2015 Mugello special helmet and its impressive mirrored finish. 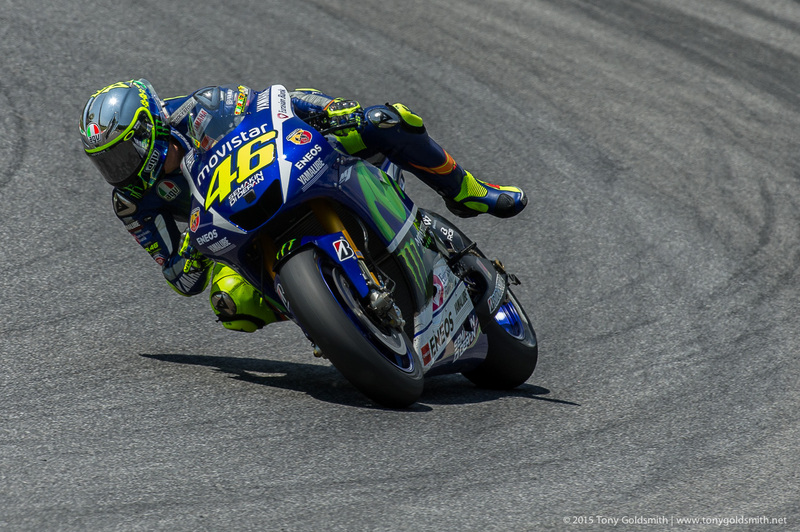 What did we learn from the first day of practice at Mugello? We learned that Jorge Lorenzo is still at the same steamroller pace he was at Jerez and Le Mans. That Valentino Rossi is following a plan, rather than chasing a lap time. That the Ducatis are fast, almost obscenely so, and that’s before they put their special Mugello engine in. That Aleix Espargaro is one tough son of a gun. That the Hondas are still fast, when the conditions are right. And that Mugello might just be one of the places the conditions are likely to be right. Why would the Honda be good at Mugello when it was so bad at Le Mans? Marc Márquez explained in a little more detail after practice on Friday. The biggest problem of the Honda RC213V is the aggressive nature of its engine, both in acceleration and braking. In braking, the bike is sliding more than the riders want it to, and in acceleration, the riders are having to fight the bike’s willingness to wheelie and spin out of the corner. Because Mugello is such a fast track (more of that later), the teams have to gear the bikes longer, both for the main straight and for the more flowing corners. Longer gearing means that the engine has to work harder to try to lift the front wheel, taming the power a little. Out of the 50 states in The Union, only California allows lane-splitting on public roads and highways. California’s position on lane-splitting has always been a bit nebulous though, falling only under the “safe and prudent” provision of the California Vehicle Code. Several attempts to demystify California’s policy on lane-splitting have come and gone, including the very public kerfuffle with the California Highway Patrol’s riding “guidelines” for lane-splitting. Most recent attempts to “legalize” lane-splitting have seen laws that were even more restrictive than the CHP’s frankly fair provisions, and created much ire in California’s vocal riding community. On the table now though is Assembly Bill 51, which would actually grant more privileges than what the CHP deemed reasonable, and could set the tone for a larger national push of lane-splitting. Yamaha MT-25 Debuting June 6th? Word from Indonesia is that the Yamaha MT-25 is about to officially break cover, and Yamaha Indonesia is already teasing the date. As the name implies, the Yamaha MT-25 is the naked version of the Yamaha YZF-R25 sport bike, and it should look a little something like this. With a 250cc parallel-twin at its heart, the MT-25 will go head-to-head against the Honda CB300F and Suzuki GW250F, and provide a more upright alternative to the current crop of quarter-liter sport bikes.